On top of the Raspberry Pi are a row of pins that can be given specific tasks to collect or send out data. These are called GPIO (General Purpose Input Output) pins and can be hooked up to a variety of components that either take in or send out data. It helps to begin by thinking of how a basic circuit works with an LED, a resistor, and a switch. Note the long tail on one side of the LED connected to the positive side of the battery. LED bulbs function directionally. The resistor slows down the amount of current reaching the bulb. The switch simply is open or closed, allowing current to flow. The breadboard is a tool that is used to help connect up wires without interacting. 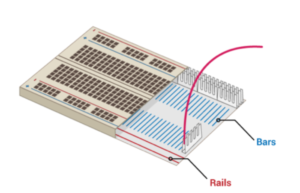 This diagram with the top removed shows how rails connect so that electricity can flow without interacting. 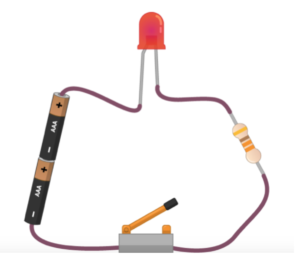 Follow along with the video to connect up a simple circuit with an LED and a button.